A cube is also a hexahedron because it is a polyhedron with 6 (hexa- means 6) faces. Cubes make nice 6-sided dice, because they are regular in shape, and each face is the same size. In fact, you can make fair dice using all of the Platonic Solids. cut out the shape and glue it together. 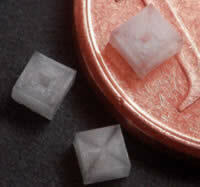 Salt crystals grow in cube-like shapes.